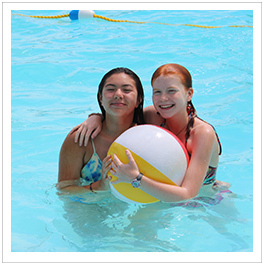 Learn to swim or practice your strokes in our private summer camp lake and heated pool. We own the land around the spring-fed camp lake, so there are no motor boats and there is no public access. At the lake we have a spacious pavilion, sauna, waterslide, and diving rafts. Trained staff provide supervision and instruction from floating docks attached to the shore. Our solar-heated pool is over 75 feet long and provides the ideal setting for recreational swims and lessons. We offer Red Cross instruction in all levels of swimming. Water Safety Instructors and trained lifesavers head all instructional programs. Swimming, diving, windsurfing, canoeing, kayaking and fishing (bass and perch) are enjoyed every afternoon. Our lakeside pavilion for snacks and cozy wood-heated saunas add to the fun for everyone. 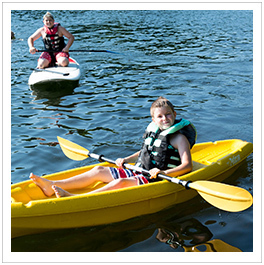 Our newest activity: Build your paddle and go paddle boarding at camp. 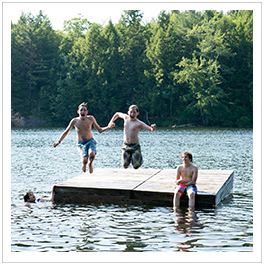 Our lake, Ledge Pond, has achieved the State of Maine’s highest rating for water quality. Meg and Peter take their first swim of the year on Mother’s Day. By the time campers arrive, the lake is warm and comfortable. No motor boats allowed on our lake, keeping it clean and quiet. GO TO THIS CAMP!! P.S. If you do go, make sure to take windsurfing. It's my favorite class. There’s so much to do at the lake. Safely learn to windsurf on our private lake.